For Special Services, first published in 1982, was the second novel by John Gardner featuring Ian Fleming's secret agent, James Bond. Carrying the Glidrose Publications copyright, it was first published in the United Kingdom by Jonathan Cape and in the United States by McCann and Geoghegan. Jonathan Cape and Hodder & Stoughton. Hardcover. 0224029347 SIGNED First British edition, first printing. Signed boldly on the inside title page. The jacket is in Near Fine condition and is NOT price clipped. The covers are clean and bright, edges are sharp. Very minor rubbing to the extremities The book itself is in Near Fine condition. Pages are clean and white. Binding is straight and tight. No remainder mark. ; Signed By Author. ; Signed by Author All books are marked down 35% until February 1, 2019. Start stocking up now! . Fine. 1982. First Edition. London: Cape & Hodder & Stoughton. Fine in Near Fine dust jacket. 1982. First Edition; First Printing; Signed by Author. Hardcover. 0224029347 . A very attractive first edition/first printing in Fine condition in Near Fine, unpriced (export) dust-jacket with slight sunning and rubbing along the spine and edges, SIGNED by author John Gardner on the title page; This is the Bond for the 80's created by Ian Fleming predecessor, John Gardner. SPECTRE is up to its old tricks, but Agent 007 and his female friend Cedar have a few up their sleeves, and they'll need them when a mysterious art collector named Markus Bismaquer appears to be collecting more than prints. 007 is double-crossed by an unusual adversary---a one-breasted woman named Nena who Bond finds out, too late, is the daughter of the late Blofeld . 1982-01-01. New. Ships with Tracking Number! INTERNATIONAL WORLDWIDE Shipping available. Buy with confidence, excellent customer service! 1995-01-01. New. Ships with Tracking Number! INTERNATIONAL WORLDWIDE Shipping available. Buy with confidence, excellent customer service! London: Jonathan Cape Limited, 1982. 1st Edition . Hardcover. Fine/Near Fine. Cape & Hodder & Stoughton, London, 1982. Hardcover. Book Condition: Fine. Dust Jacket Condition: Near Fine. First Edition; First Printing. 8vo ; 254,  pages; A very attractive First Edition/First Printing in Fine condition in Near Fine, unpriced dust-jacket. London: Jonathan Cape and Hodder & Stoughton, 1982. First Edition UK / First Impression / True First Ed. A near fine copy in like D/W with no price to the inside flap (denoting an export copy). Black cloth over board. Gilt to spine. Binding remains tight with no inscriptions or markings in the text block. Minor tanning to edges of text block. DJ in very good+ condition. Fully intact, showing slight rubbing and minimal shelf wear. Colours remain vivid and unfaded. Collectible Condition of author's second contribution to the James Bond book series. Cellophane wrapping to preserve current condition. Buy with confidence. London: Jonathan Cape Limited, 1982. 1st Edition . Hardcover. Near Fine/Good. Cape & Hodder & Stoughton, London, 1982. Hardcover. Book Condition: Fine. Dust Jacket Condition: Near Fine. First Edition; First Printing. 8vo ; 254,  pages; A very attractive First Edition/First Printing in Fine condition in Near Fine, unpriced dust-jacket. [London]: Jonathan Cape and Hodder & Stoughton, . First edition. Age darkening to text paper, a fine copy in a fine dust jacket. (14910). Octavo, boards. The second of the James Bond novels written by John Gardner. 1982-07-05. New. Ships with Tracking Number! INTERNATIONAL WORLDWIDE Shipping available. Buy with confidence, excellent customer service! 1987-07-01. New. Ships with Tracking Number! INTERNATIONAL WORLDWIDE Shipping available. Buy with confidence, excellent customer service! 1983-04-01. New. Ships with Tracking Number! INTERNATIONAL WORLDWIDE Shipping available. Buy with confidence, excellent customer service! 2011-08-07. New. Ships with Tracking Number! INTERNATIONAL WORLDWIDE Shipping available. Buy with confidence, excellent customer service! 2012-02-01. New. Ships with Tracking Number! INTERNATIONAL WORLDWIDE Shipping available. Buy with confidence, excellent customer service! 1982-12-01. Good. Ships with Tracking Number! INTERNATIONAL WORLDWIDE Shipping available. May not contain Access Codes or Supplements. May be ex-library. Shipping & Handling by region. Buy with confidence, excellent customer service! 1983-04-01. Good. Ships with Tracking Number! INTERNATIONAL WORLDWIDE Shipping available. May not contain Access Codes or Supplements. May be ex-library. Shipping & Handling by region. Buy with confidence, excellent customer service! 2011-05-03. Good. Ships with Tracking Number! INTERNATIONAL WORLDWIDE Shipping available. May not contain Access Codes or Supplements. May be ex-library. Shipping & Handling by region. Buy with confidence, excellent customer service! 1982-01-01. Good. Ships with Tracking Number! INTERNATIONAL WORLDWIDE Shipping available. May not contain Access Codes or Supplements. May be ex-library. Shipping & Handling by region. Buy with confidence, excellent customer service! 2012-02-01. Good. Ships with Tracking Number! INTERNATIONAL WORLDWIDE Shipping available. May not contain Access Codes or Supplements. May be ex-library. Shipping & Handling by region. Buy with confidence, excellent customer service! LONDON: JONATHAN CAPE AND HODDER & STOUGHTON.. Near Fine in Fine dust jacket. 1982. First Edition; First Printing. Hardcover. 0224029347 . First Commonwealth edition. About fine in fine Commonwealth/for export dust jacket without printed price on front jacket flap. (Text age toned. ) . London: Cape, 1982. First Edition. Hard Cover. Dust Jacket. First UK Edition. A near fine copy in like D/W with no price to the inside flap (denoting an export copy). Signed to the rear flap by Bill Botten who designed and painted the D/W artwork. Hardcover. 298 pp. Coward, McCann & Geoghegan, New York (1982). First American Edition. First Printing thus. $9.95 DJ price. 8204 Date Code on DJ flap. Bright, clean, unmarked copy appears to be unread. Pages crisp and tight. No flaws noted. 08 May 1982 retail sticker on rear DJ panel. As New/As New. More photos on request. Shipped in a box within a box, in bubble wrap, with a tracking number. Jonathan Cape, London., 1982. First edition. Octavo. 254 pages plus a one page afterword. The second of Gardner's follow-on James Bond books.Tail of spine slightly bumped, otherwise fine in very good indeed, price-clipped dustwrapper a bit rubbed at the edges. Jonathan Cape and Hodder & Stoughton, London., 1982. First edition. Octavo. 254 pages. The second of John Gardner's James Bond novels.The cheap paper has faintly tanned. Fine in near-fine dustwrapper faded at the spine. London: Cape, 1982. First Edition. Hard Cover. Dust Jacket. First UK Edition. A VG copy in like D/W with no price to the inside flap (denoting an export copy). Signed to the rear flap by Bill Botten who designed and painted the D/W artwork. London : Jonathan Cape and Hodder & Stoughton, 1982. First Edition. Fine cloth copy in a very good, slightly edge-nicked and dust-dulled dust wrapper, now mylar-sleeved. Remains particularly and surprisingly well-preserved; tight, bright, clean and sharp-cornered.
. Physical description; 254 pages ; 22 cm. Notes; NOT price-clipped. First edition and first printing. Summary; 007, on secret loan to the U.S., unites with the tough-minded and gorgeous Cedar to defeat their enemy, the legendary SPECTRE. Subjects; Bond, James -- (Fictitious character) -- Fiction. Intelligence service -- Great Britain -- Fiction. Bond, James -- (Fictitious character). Genres; Fiction. Spy stories. Jonathan Cape. Hardcover. B000M67XTS Ex-library book with usual markings. Missing dust jacket; otherwise in excellent condition. Acceptable Condition. Five star seller - Buy with confidence! . Fair. UK: Jonathan Cape, Hodder & Stoughton, 1982. 1st Edition 1st Printing. Hardcover. Fine/Fine. 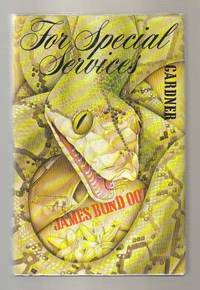 For Special Services by John Gardner First Edition Jonathan Cape & Hodder & Stoughton 1982. No inscriptions, no foxing. Light toning to page edges. Unblemished throughout. Covers fine in like original dust jacket, not price clipped and with no fading or toning to spine. G K Hall & Co, 1983-01. Hardcover. Good. London: Jonathan Cape and Hodder & Stoughton, 1982. Black boards. Text paper yellowed as always, else fine in fine jacket, nice. His second James Bond novel. . First printing. Hardcover. Octavo. Coward Mc Cann. Hardcover. 069811163X New Condition. . New. Pegasus Books. PAPERBACK. 160598194X New Condition. . New. 1982-07-05. Good. Ships with Tracking Number! INTERNATIONAL WORLDWIDE Shipping available. May not contain Access Codes or Supplements. May be ex-library. Shipping & Handling by region. Buy with confidence, excellent customer service! Jonathan Cape and Hodder & Stoughton, 1982. 1st edition. Hardcover. Fine black boards, very clean pages, in a very near fine, unclipped dustjacket. The second of the author's James Bond continuation novels. New York: Coward Mc Cann. 1982. First Edition; First Printing. Hardcover. 069811163X . Very Good in a Very Good dust jacket. ; 8.50 X 5.70 X 1.20 inches; 298 pages; Original unclipped dust jacket protected by archival Brodart cover. All domestic orders shipped protected in a Box. .
Berkley, 1986-03-01. Mass Market Paperback. Used:Good. London: Jonathan Cape. First edition of this Bond novel. Octavo, original cloth. Fine in a near fine dust jacket. Jacket design by Bill Botten. In For Special Services, Bond is on loan to the United States government, his partner none other than the tough and beautiful Cedar, daughter of 007's old friend Felix Leiter. Their enemy? An old adversary, the legendary SPECTRE has reappeared. Bond and Cedar find themselves in some deadly and terrifying situations-from skyjack to plunging elevator, from armies of killer ants in the Midwest to horror on a private monorail-before they come face to face with the heir to Blofeld's iniquitous empire. [London]: Jonathan Cape and Hodder & Stoughton, . First Edition. Hardcover. Octavo (20.5cm. ); original boards in pictorial dust jacket; 254pp. Very light shelf wear with brief rubbing to flap folds, corners very gently bumped, else Very Good to Near Fine. Gardner's second James Bond novel. New York: Coward Mc Cann. 1982. First Edition; First Printing. Hardcover. 069811163x . Very Good+ in a Very Good dust jacket. Scuffing and toning to front and rear panels. Peeling to upper front and rear flaps as well as front and rear panels. ; 8.30 X 5.40 X 0.90 inches; 298 pages; Original unclipped dust jacket protected by archival Brodart cover. All domestic orders shipped protected in a Box. .
Coward Mc Cann, 1982-01-01. Hardcover. Used:Good. London: Jonathan Cape and Hodder & Stoughton , 1982. John Gardners 2nd Bond Book. Bond teams up with CIA agent Cedar Leiter, daughter of his old friend, Felix Leiter, to investigate one Markus Bismaquer, who is suspected of reviving the criminal organisation SPECTRE, which was believed to have been disbanded years earlier following the death of its leader, Ernst Stavro Blofeld, at the hands of Bond (in You Only Live Twice). CONDITION Black bds with Gilt spine title (unworn) 255 pages. Copy is bright and crisp with slight atmospheric toning to end pages and interior of DJ spine o/w bright crisp and unworn. First Edition. Hard Cover. Near Fine/Near Fine. 8vo - over 7¾" - 9¾" tall. New York: Coward, McCann & Geoghegan. 1982. First Edition; First Printing. Hardcover. 069811163x . Very Good- in a Very Good price clipped dust jacket. Spine is cocked. Edgewear to jacket. ; 8.50 X 5.70 X 1.20 inches; 298 pages; Original dust jacket protected by archival Brodart cover. All domestic orders shipped protected in a Box. .
2011-08-07. Good. Ships with Tracking Number! INTERNATIONAL WORLDWIDE Shipping available. May not contain Access Codes or Supplements. May be ex-library. Shipping & Handling by region. Buy with confidence, excellent customer service!